Why are most capitalist enterprises of any size organized as authoritarian bureaucracies rather than incorporating genuine employee participation that would give the workers real authority? Even firms with employee participation programs leave virtually all decision-making power in the hands of management. The standard answer is that hierarchy is more economically efficient than any sort of genuine participation, so that participatory firms would be less productive and lose out to more traditional competitors. This answer is indefensible. 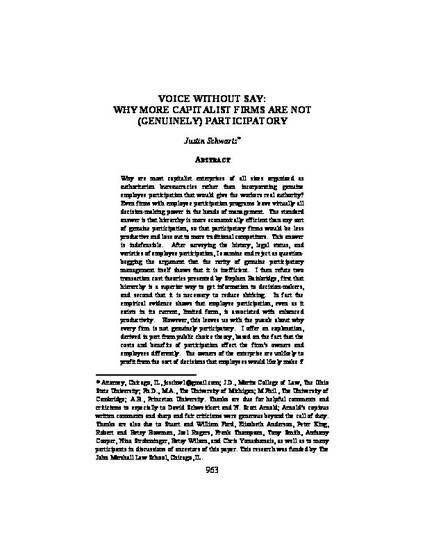 After surveying the history, legal status, and varieties of employee participation, I examine and reject as question-begging the argument that the rarity of genuine participatory management itself shows that it is inefficient. I then refute two transaction cost theories presented by Stephen Bainbridge, first that hierarchy is a superior way to get information to decision-makers, and second that it is necessary to reduce shirking. In fact the empirical evidence shows that employee participation even as it exists in its current, limited form, is associated with enhanced productivity. This, however, leaves us with the puzzle about why every firm is not genuinely participatory. I offer an explanation, derived in part from public choice theory, based on the fact that the costs and benefits of participation affect the firm’s owners and employees differently. The owners of the enterprise are unlikely to profit from the sort of decisions that employees would likely make if they had the power to do so, even if these decisions enhanced productivity, and by implication, profitability. Greater profits for the firm would often mean fewer profits for the owners and managers, who accordingly have a strong incentive to resist genuine employee participation.